Every week, Big Box Storage makes numerous storage unit deliveries to Coronado. Whether you live near the Cays, Hotel Del or near the bridge, the company has likely delivered a “Big Box” to one of your 92118 neighbors in the recent past. If you’re in need of storage and you reside in Coronado, you’ll find that Big Box Storage is your most convenient, as well as economical storage option. The company also offers delivery and pickup within other local beach communities such as storage in Pacific Beach and Ocean Beach. The company’s service is one in which a Big Box is delivered right to your Coronado address. Each storage container is identical in terms of size – 8’ long by 5’ wide by 7’ tall. If you’re only storing one to two rooms of items, one Big Box will likely be sufficient. Otherwise, you can order as many as you may need. The storage space estimator can help you to determine just how many you might need. Delivery and pickup is free (based on a 3 month min. stay) – a savings of $99. Once delivered, load the Big Box at your pace and, once completed, it will be picked up for accessible, secure indoor storing at the company’s local facility. While in storage, you’ll be able to access your items seven days a week. 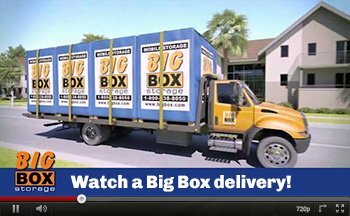 Finally, once you decide that storage is no longer needed, you can simply pick up the phone and schedule to have the Big Box redelivered to you in Coronado or, if you’re moving long-distance, anywhere across the country. 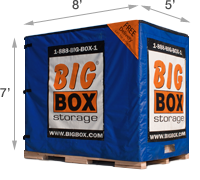 Please take a moment to check out the great rates provided by Big Box Storage. Each one is backed by a low-price guarantee in which the company will beat any competitor (in Coronado or elsewhere in San Diego County) by a least ten percent. Schedule a Big Box delivery online and receive an immediate discount of $25. Alternatively, should you wish to schedule over the telephone, please call 619-436-5020 to speak directly with a helpful representative.